Andrew: One of the more recent trends in craft brewing is collaboration. That’s when two or more brewers from different breweries work together to create a beer recipe. On rare occasions, brewers actually blend two completely unique beers together to make a new hybrid, mutant beer. I’ve recently picked up a bunch of collaboration beers (see above). 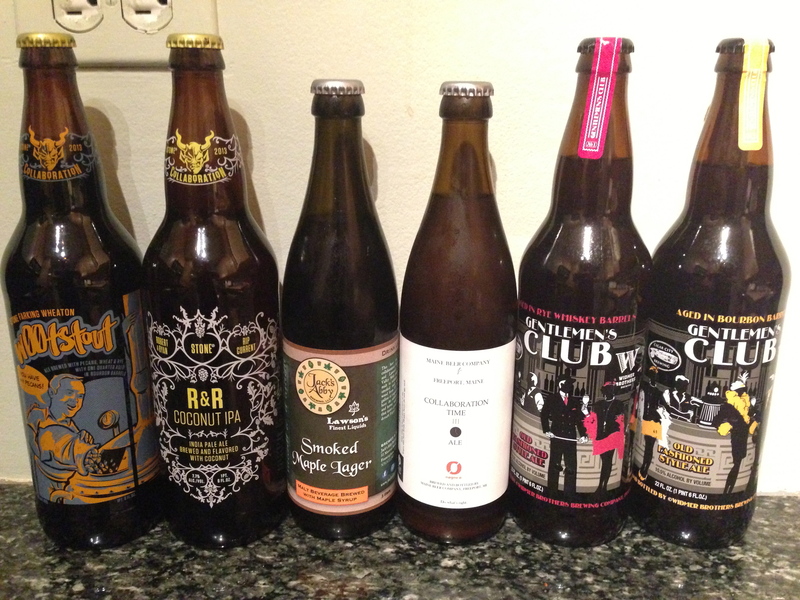 Of the beers pictured, I’ve only tried the Stone Farking Wheaton W00tstout. Yeah, the name is insanely long, weird, and geeky. “Stone” is obvious. “Farking” is for the guy who started Fark.com, who was one of the collaborators. Actor Wil Wheaton was the other collaborator. Stone is really well-know for their hoppy ales, but they also make really amazing stouts that are some of my favorites and this might be their best yet. 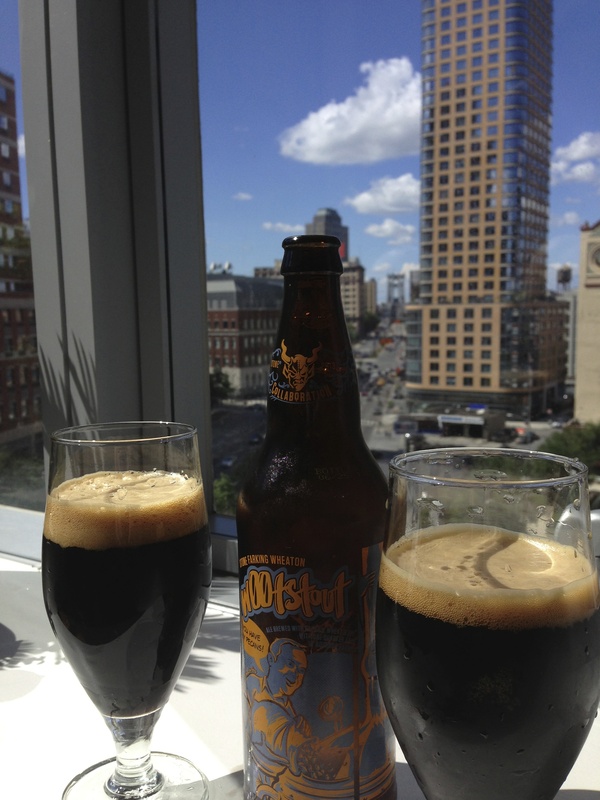 This Imperial Stout is brewed with pecans and aged rye whiskey barrels. Then, one-quarter of the beer was aged in bourbon barrels and blended back in with the rest of the beer. I’m guessing that makes the bourbon not so overpowering (by not aging the whole batch in bourbon barrels). First, before you drink this beer, you have to realize that it’s a sipper. It’s strong—13% ABV—but you don’t want to drink this fast for other reasons other than the ABV. It’s amazingly complex. When you take a sip, you get the bourbon right off the bat. Then you get the sweetness and burn of the rye whiskey. And theeeeen . . . you get this nutty flavor that stays in your mouth as you drink it. It’s like having dessert in a glass and it’s delicious. Originally dreamt up by homebrewers Robert Masterson and Ryan Reschan, who earned themselves the top prize in our 2013 American Homebrewers Association homebrewing contest, this innovative beer marks a refreshing sea change for IPA lovers everywhere. It was brewed with 280 pounds of coconut and an unusual blend of hop varieties, including a few from faraway lands or just brand spankin’ new, and is guaranteed to taste like no IPA that’s gone before. Prepare yourself for a tropical breeze of a brew that will lull you to a place of tranquil contentment for a little R & R. P.S., I told you about the last two collaborations when I tried the Oak and Rye Whiskey on tap. Good expo on collaboration beers.